Being a frequent honorary islander on the Isle of Anglesey due to the other half being born and bred there, we’ve been slowly ticking off some of the best spots for food there over the past year and don’t ask me how many months (queue red cheek syndrome). 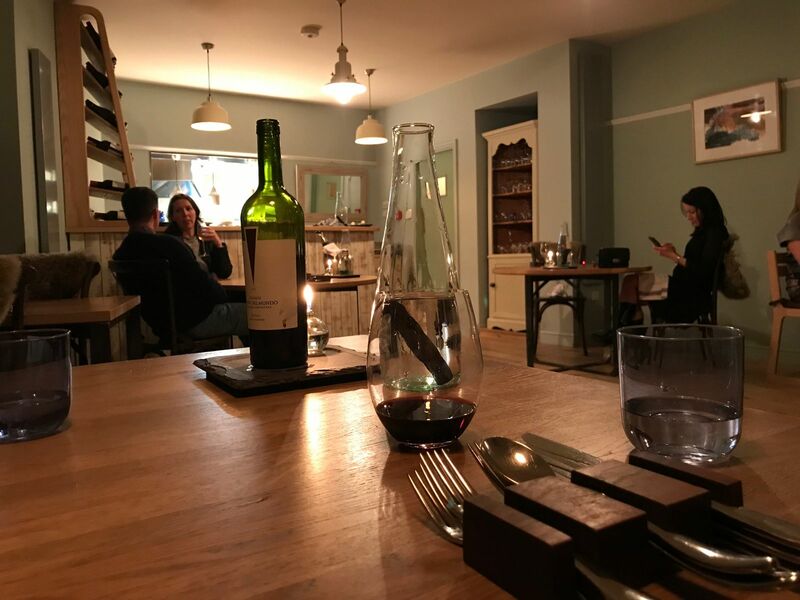 We’ve been to local favourite Lobster Pot and then Marram Grass over the Christmas period but it’s our 6 month spot on the waiting list for Ynys Mon’s only Michelin Star restaurant Sosban and the old butchers we’ve been counting down the days till. Having just missed the last round of bookings where 6 months of tables at the 12 seater restaurant are released and snapped up in the blink of an eye but we were lucky enough in October to book a table for Menai Bridge’s hottest ticket in town. The menu is a closely guarded secret until you arrive and you are taken on a journey from sea to farm through the 9 dishes of the tasting menu, expertly crafted by a single chef in a tiny kitchen. Apart from a someone who sometimes helps with the dishes there is only one other person working at Sosban and the old butchers and that is wife of the chef and front of house, which makes it an even more of an extraordinary feat to be awarded such a highly sought after accolade of a Michelin Star. Located at No1 High Street in Menai Bridge in an unsuspecting mint coloured building, inside just 6 tables and whilst we dinned just 10 of us eating. They’ve kept the old tiles on the wall from when it used to be a butchers and with just a small back bar and pass where the food comes out, you have the waitress’s full attention. It’s like dinning in someone’s front living room, which immediately put me at ease being my first visit to a Michelin Star restaurant as I imagined most of them can be quite pretentious. I loved how calm and relaxed it was this side of the kitchen, although I’m not sure chef would say the same single handily serving everyone in the restaurant Thursday to Saturday. 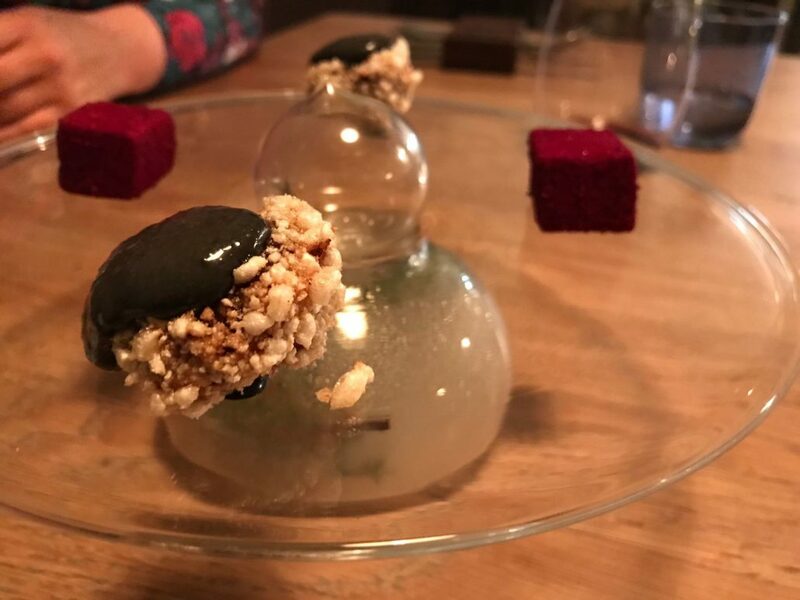 There is just one menu and you are only told once you arrived although we opted to keep it a surprise and learn of each dish as it arrived and the cost of the tasting menu is £80 per person. It was a little hard to order a bottle of wine, our own fault opting to keep it a surprise as we didn’t know what drink would best suit the dishes. We opted for an Argentinian Malbec at a cost of £28. We were served a couple of appetisers to keep us going until the more substantial dishes came out such as crispy cod skin, curried banana and peanut, which had a lovely crunch but instantly melted on the tongue. 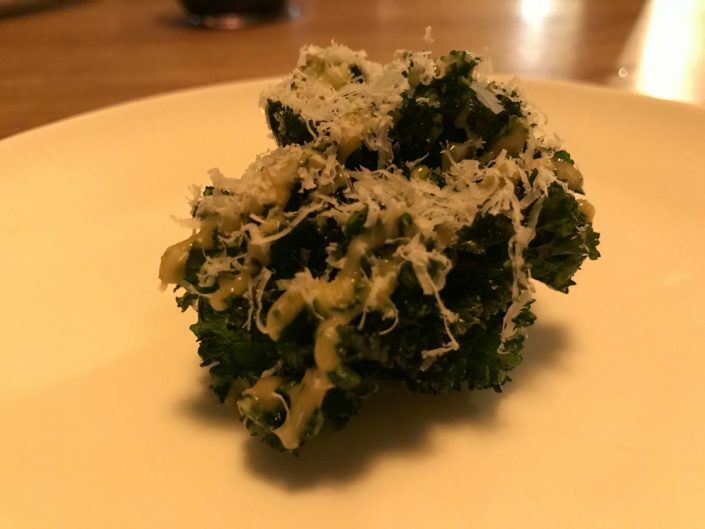 Another crispy one followed with kale bomb with crispy leaves, Caesar dressing and sprinkled with pecorino cheese. Small and bite sized, well two bites as I wanted to saver it instead of going down without touching the sides. They both packed a punch for their size. Next up was a plate expertly curated by the host and offered something to entice all of the senses. A nugget sized portion of soft tender lamb entombed in a rice crispy esque skin with a dollop of laverbread mouse. Soft, crispy, tender and moist encapsulated into a manageable bite. In the centre of the plate lay a misty vessel waiting to be opened, which when opened released a hit of smokey juniper leaves. This was presented with a purple cube of the softest marshmallow ever to enter my mouth but with an earthy beet lingering taste. Appetisers done with, next up was my poison. 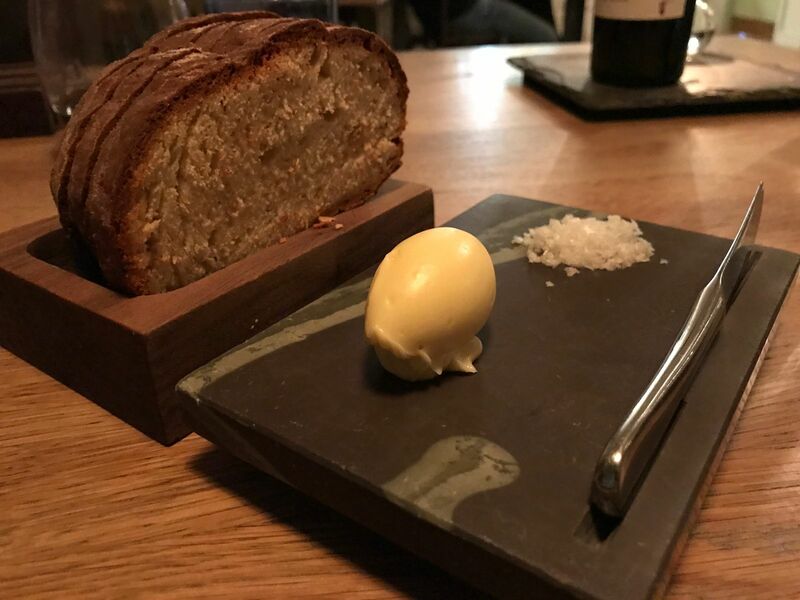 Warm, freshly baked bread with homemade butter and generous mountain of sea salt, no doubt hailing from the waters some 50 metres away. The bread was almost pudding like, fluffy and sweet with the soft rich butter and added crunch and explosions of salt with my overzealous application of sea salt. The bread would of worked equally as well with jam and clotted cream if by a miracle there had been any left. On to the starter of asparagus with yolk jam, welsh truffle and a scattering of almost toasted breadcrumb like crispy chicken skin. I do like asparagus when it’s cooked well but there’s nothing worse than a soggy one. 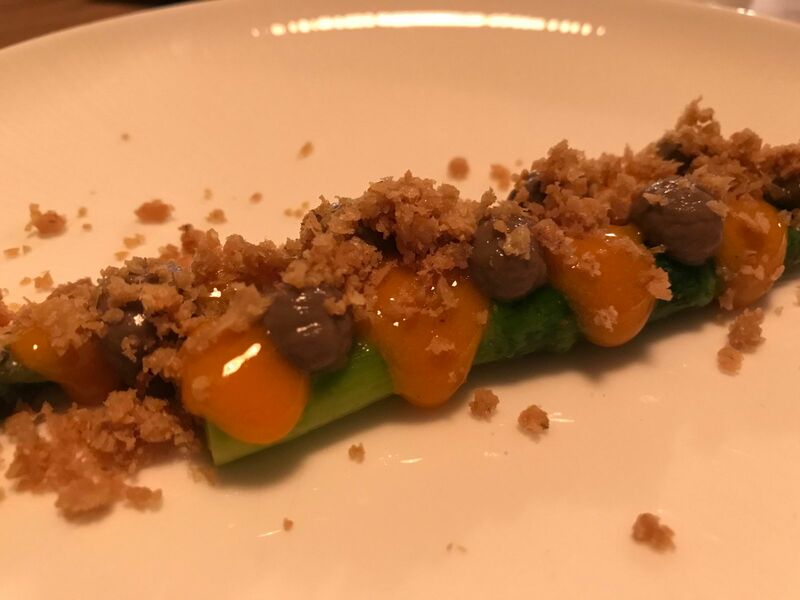 This as expected was cooked perfectly and when transported into one’s mouth mixed with the rich toppings brought a thick emulsion of flavour when both yolk and truffley chicken skin collided. The other half usually detests asparagus but you would have been hard pressed to have found a scrap left on her plate. 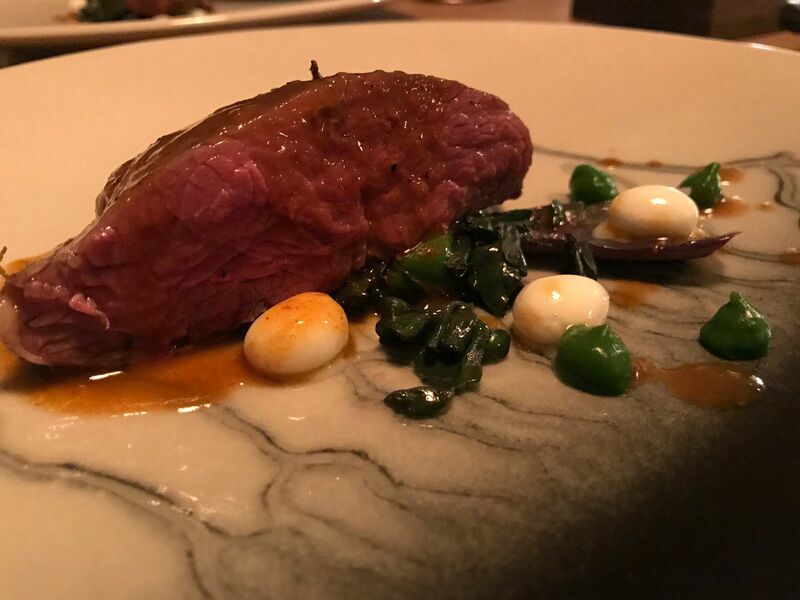 The first of two mains was a succulent, generous slice of salt aged lamb with wild garlic and little pearls of sheep’s yogurt that burst with ever so slight pressure of the fork. Normally one to devour a meat dish in seconds, I carved away slowly at my lamb to savour the taste with the helping hand from scoops of the wild garlic and the sheep’s yogurt that cut through the richness of the meat and mellow the wild garlic. The last of my glass of the Malbec married perfectly. I didn’t inspect the bottle at first but soon learned how potent it was after the first glass and having a bit of a head on already with it being 14%. Not a bad thing though as it was very quaffable. Not being ones to waste ingredients, next up was the cod fillet that was skinned and said skin used for the first appetiser and the perfect time to order a fresh bottle of vino, although a white to go better with the fish dish. The price on wine was quite reasonable I’d say, with options from £20 up to champagne around £120 for an extra special occasion. Glasses aren’t advertised on the menu but the waitress was willing to allow us to purchase specific bottles by the glass but we ended up going for a bottle anyway priced again at £28. 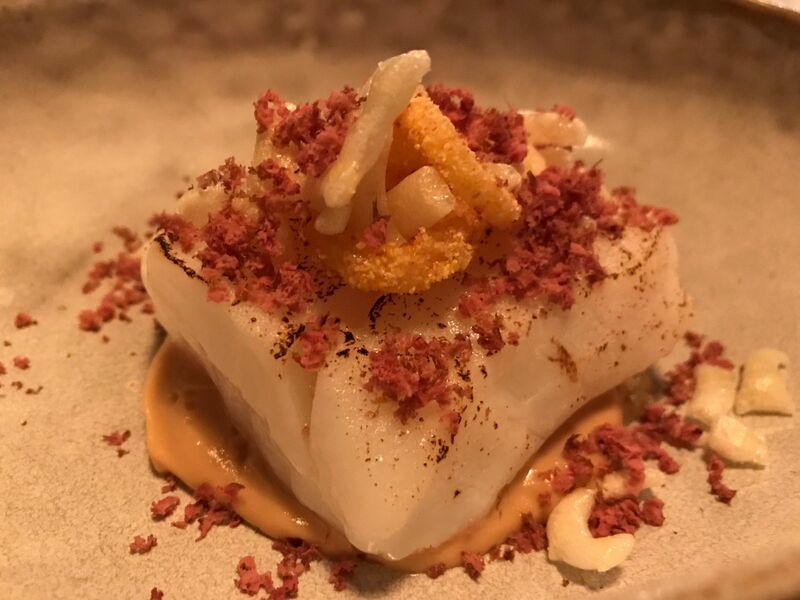 The menu read Cod, yeast puree, potato, pickled onion and ox heart for this course. The cod cooked beautifully and flaked with ease on contact with my fork. I loved the battered and fried pickled onions as they reminded me of pickled onion crisps I used to have after swimming lessons down my local sports centre when I was a kid. The dried and shaved ox heart I’d seen only the day before on the Masterchef finals when they travelled to Peru, which I was very intrigued by on the show so I was more than impressed when I got to see it in real life on my dish. Having worked our way through an array of savouries, it was now on to the sweets of the tasting menu and first up was the Rhubarb and custard as outlined by the menu but it was way more than just that. 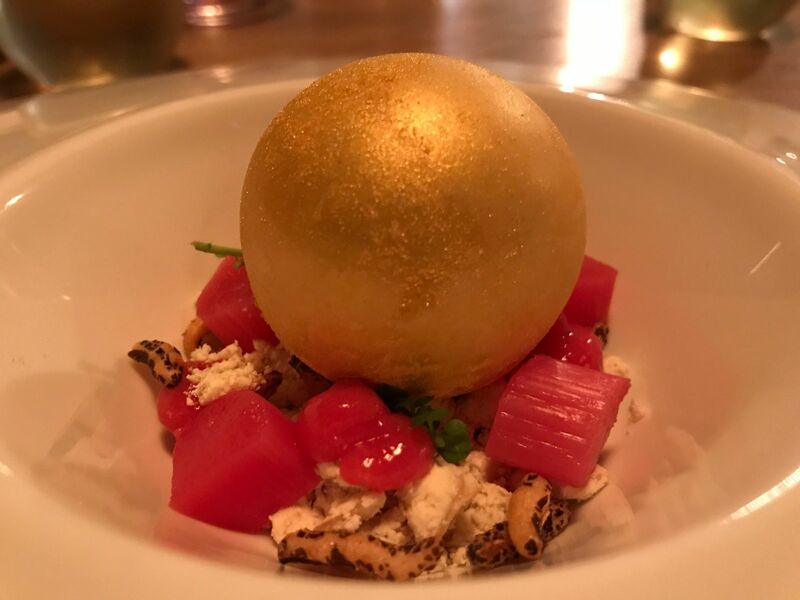 With a perfect golden globe of white chocolate nestled between stewed rhubarb and puffed rice. The chocolate globe waiting to be smashed to release the vanilla pebbled custard magma core. The really liked the contrast in textures and flavours from creamy custard, soft rhubarb with dry and crispy puffed rice and velvety white chocolate. A very dreamy plate of dessert and like none I’ve ever tried before. Last but not least brings us to the lemon, olive oil and chocolate final dish. 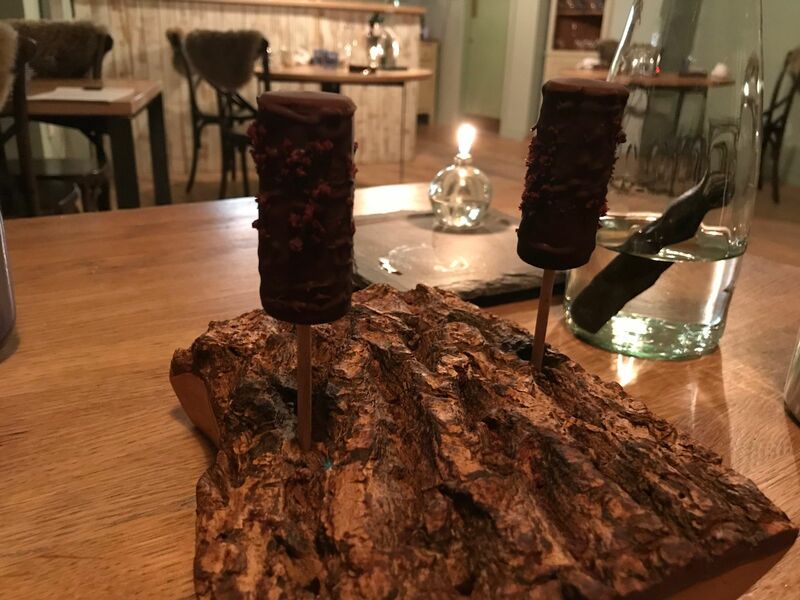 I thought we were having a whole chocolate log when a huge log started making it’s way to our table, but it was just the base for the lemon, olive oil and chocolate ice cream lolly. Not too disappointed I didn’t have to attack a whole log as I was pleasantly full at this point and much to my surprise as I was worried I might have to pop in a somewhere for a bag of chips on the way home. Light lemony ice cream, subtle hints of olive oil encased in a crisp chocolate shell. A perfect end to a perfect meal. The other half is still banging on about the lolly to this day some 2 weeks later. As mentioned previously this was my first encounter of Michelin Star quality food and without a peek of the menu beforehand I really didn’t know what to expect, although I was worried everything was going to be laser cut and eaten with tweezers leaving me still hungry but this was far from the truth. We had 8-9 dishes although the first few were appetisers and just bites the starters, two middle courses and two desserts certainly filled me up by the end of it as I do have a bit of an appetite. The service was excellent and thought the front of house delivered a curated journey through each of the courses and always at hand for drinks or anything else we needed whilst sat at our table. I loved how homely it felt and relaxed for the calibre of food presented to us. The food was delicious from start to finish. I was adamant I would have a tasting menu of salmon 8 ways as it’s one of the only things I don’t like and without knowing what was on the menu, but luckily for me there was no salmon in sight. The two fish dishes we did get were spot on though. It is still unbelievable to me how a restaurant so small with just two people working there can achieve the heights they have got to, but it just shows the hard work and determination from both chef and front of house to deliver consistently good food through the different seasons and my hats off to them. Drinks wise there was a good choice of wines, nothing too overboard with bible thick menus to choose as I’d still be sat there choosing now and a reasonable price point starting at £20 for red and white. I did see someone drinking beer, but I wasn’t sure what selection they had so another drinks menu with alternatives to wine would have been good as I always refrain from asking the front of house to recite the whole fridge from memory. I also saw a few bottles of gin nestled at the back of the restaurant near the pass and can’t remember all that were on there so again a menu would have been handy but they did have Monkey 47, which is a favourite of some friends of mine and not an entry level gin by any means. So would I recommend Sosban and the old butchers and was it worth the wait? I would recommend Sosban in a heartbeat and you can see why it has such a long waiting list not only because there are just 12 dinning per evening, but the food is quite remarkable. If you haven’t been yet then head over to their social media on twitter to be in the know when they release their next allocation of reservations as that’s how I found out just in time in October.